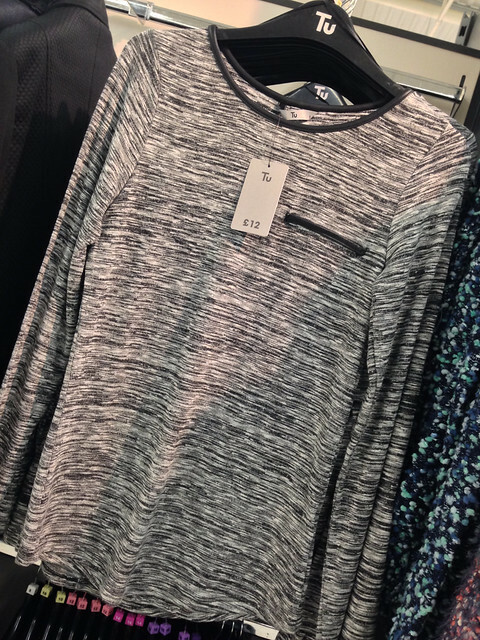 Last week Ingrid got in touch asking me if I wouldn't mind calling into one of the big Sainsburys in Belfast to see what the new season range is like. She lives a bit of a distance from a Sainsburys but was wondering if it was worth the trip. Well - rant time now...when on earth will Sainsburys get their act together and start selling online? It's a strategic decision to stay in-store only apparently but given how well other supermarkets do online, it seems like a short sighted one. 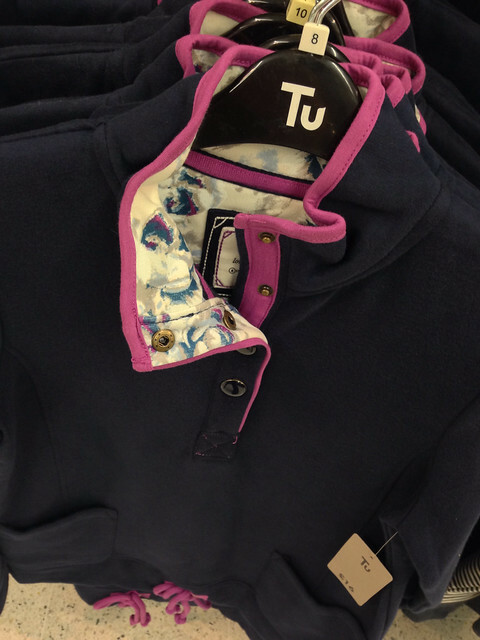 I rate the TU range highly but I don't always shop there so I sometimes miss new items coming into stock. 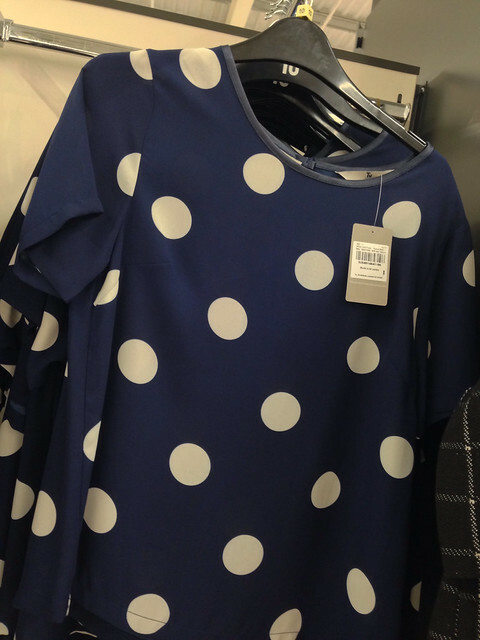 Rant over - I made the trip over to the store in West Belfast, which has the biggest clothing range of all the NI stores. 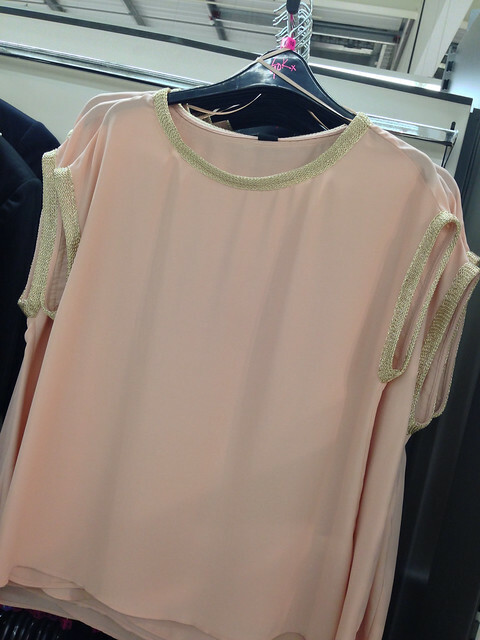 This blush coloured top is from the Gok range - which incidentally was very small and not particularly prominent. Wondering if this partnership is reaching an end? It, along with the cream top below, were the only stand out items from what they had in stock of the Gok range - it's trimmed in a gold fabric - lovely finish but sadly not a colour that suits me. 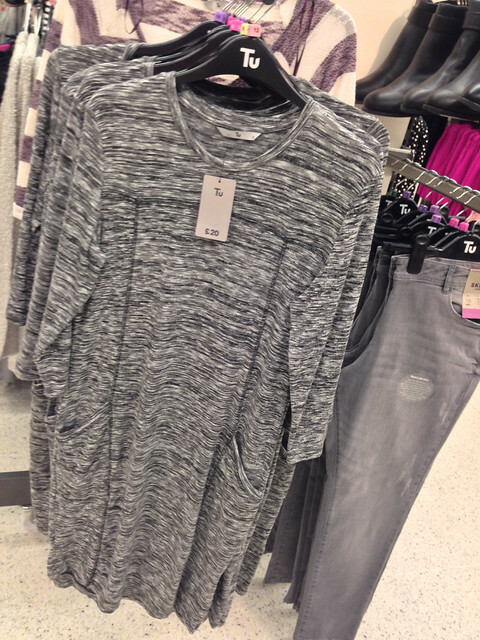 This grey marl top with pleather trim was the one thing I would have bought if I could have tried it on (fitting rooms closed for maintenance) it is a lovely weight, rather reminiscent of Zara and very well priced at £12. Some nice knitwear - including this cardigan. 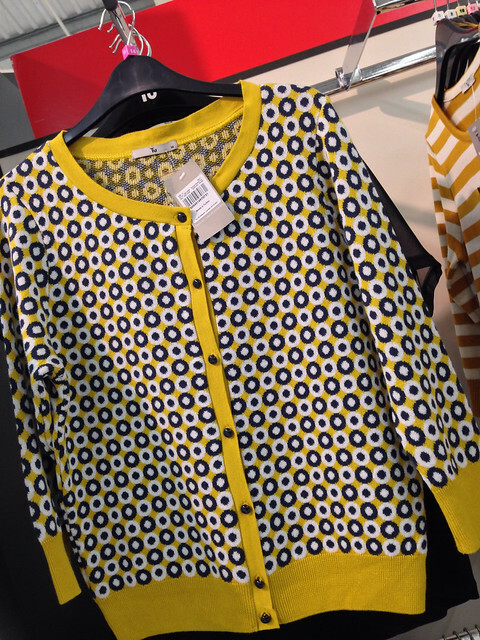 A bit Orla Kiely-esque? So now to what I could try on while remaining decent at 10am on a Saturday morning! 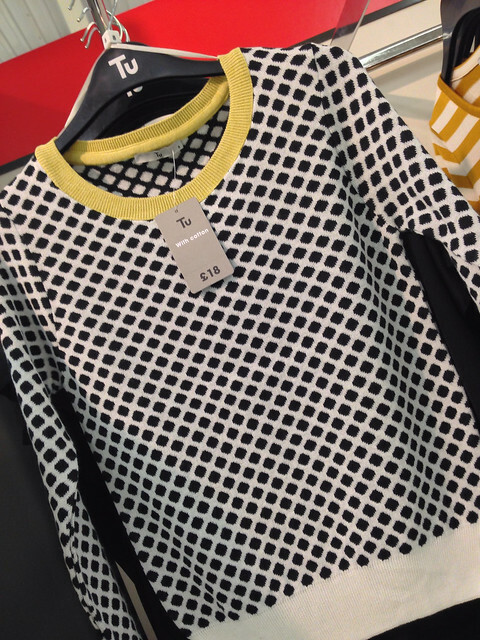 This jumper appealed immediately - love the print and the pop of yellow. ...sadly too short. I tried on a 12. Long body strikes again but I think it's veering on cropped. Not a good look for many. And this blue one is LOVELY - would have bought in a heartbeat if I was the right colouring for it...wool mix/boucle style with popper buttons. This is a 10 and it was probably a bit neat on me - so size up! Phew - that's all the pictures! Hope it was a helpful round up. I was disappointed not to see the yellow coat that Ingrid took a picture of but will keep an eye out the next time I'm in. Love the fur shawl on you ! 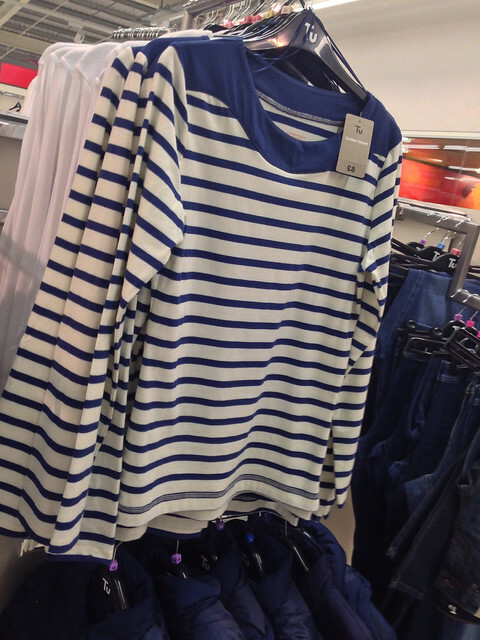 I love shopping in sainsbury and checking out the clothing range , makes me look forward to doing the food shopping ! 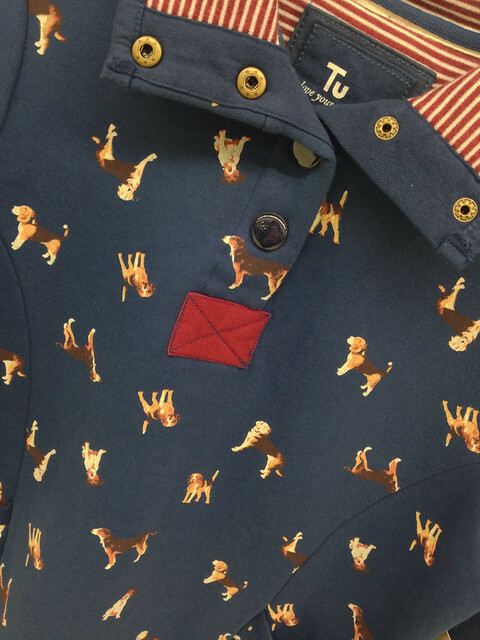 The nightwear range is very good too. Utterly stunning Avril. 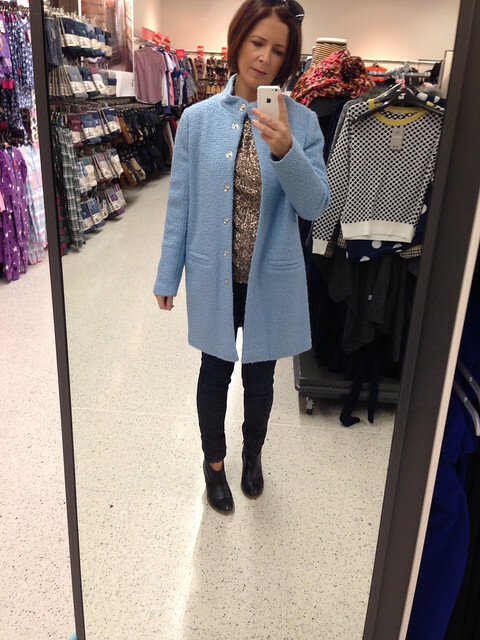 The blue coat has my name ALL over it! I can't believe Sainsbury's have been so slow, I think I'd be embarrassed if I were head of online business development! I have spoken with them in the past, my dream job would be to work with them on an online store - imagine what fun! I shop in Sainsburys on a regular basis and have been disappointed in their clothing range the last few times I have bothered to have a nosy. 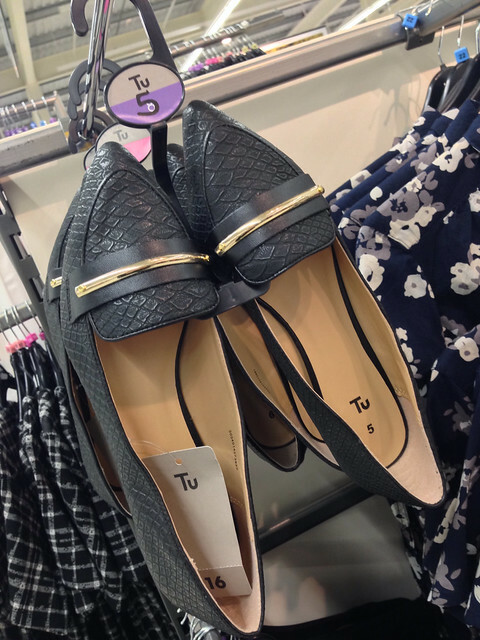 Their basics (TU jeggings and vest tops) are always great quality and decent fitting, and I do like their nightwear range but apart from that nothing has inspired me recently. I think Sainsburys have really upped their game clothes wise. 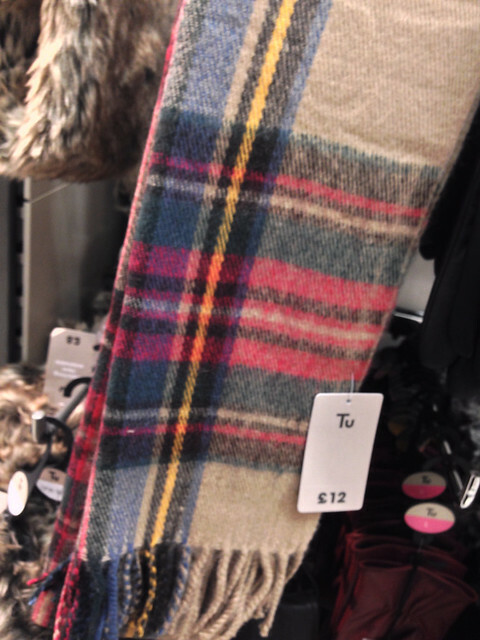 I have the tartan scarf which I bought when there was 25% off so super bargainous! My only gripe is that, as someone who is very petite, the clothes are cut rather on the generous side. 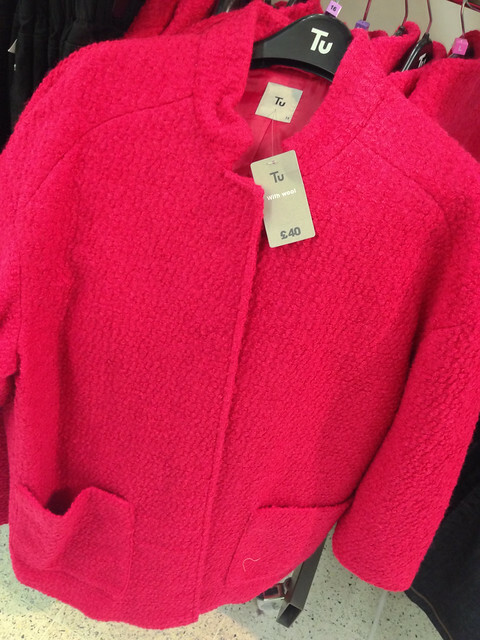 I love the raspberry boucle coat but even the 8 was massive on my small frame. 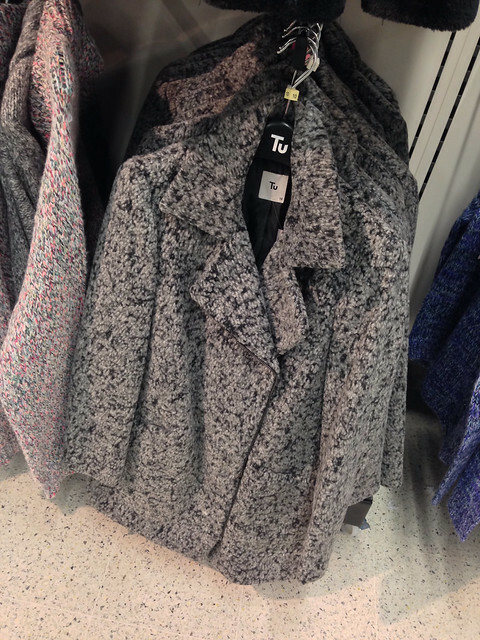 My quest for a boucle coat continues!! 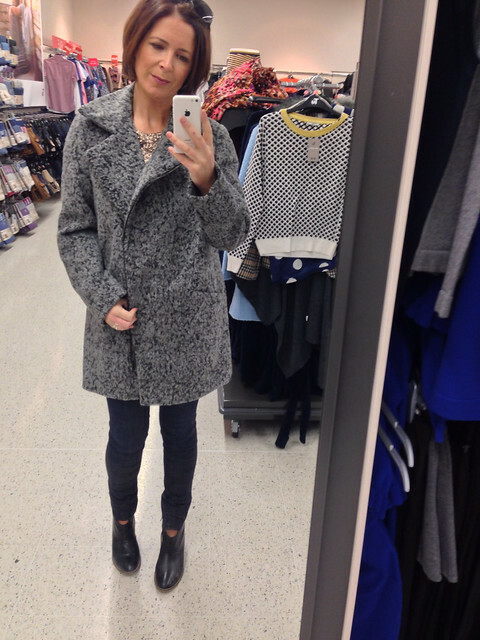 Love that blue coat on you and the grey marl top. Agree its ridiculous Sainsburys don't do on line. The one closest in Forestside is rubbish for clothes. I tend to go to Sprucefield, didn't realise there was a better one ! Angie Phillips who presents BBC N Ireland weather wears dresses from the Gok Wan range. Interesting there wasn't much of his stuff available. Thanks for doing the research, must have another look . 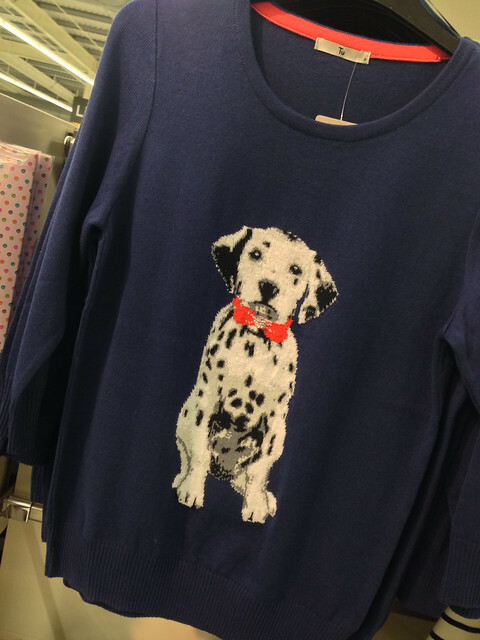 Like you the jumper with the yellow trim on the collar appealed but it looked short on the hanger. 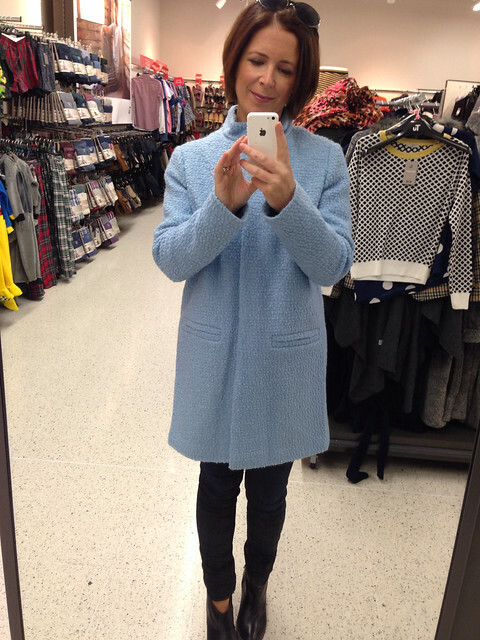 I did like the look of that pale blue coat too but I don't need a coat this year. 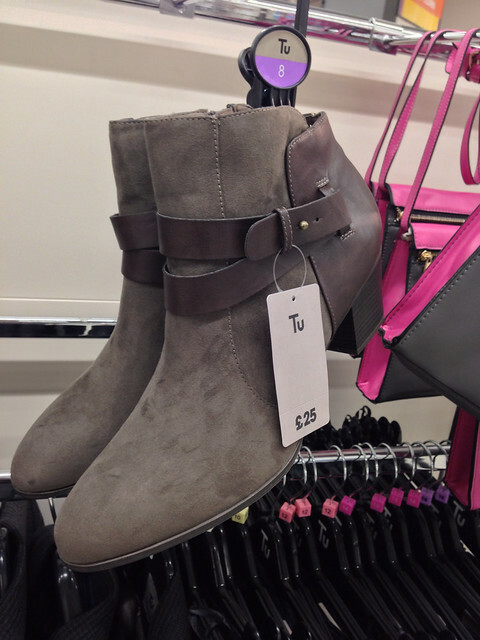 Overall there was quite a lot to like but I need to go back without the kids at 25% off time! Avril, this is a great write up. I like the blue/pink coat. 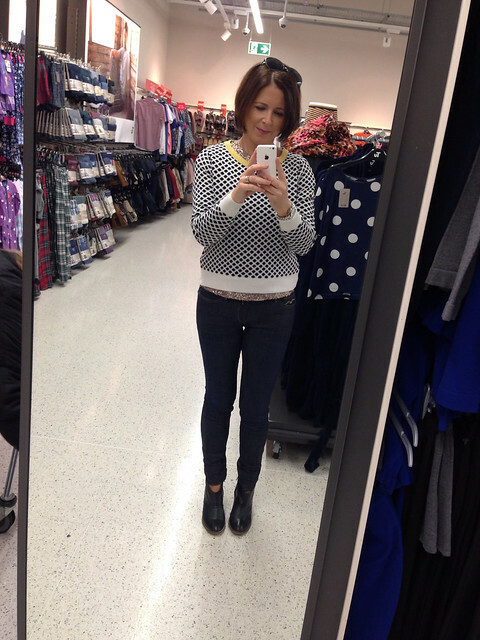 Sainsbury's do great yoga pants and workout wear. I always really enjoy your shopping 'round up' posts, I must confess I gave never looked at Sainsburys, will have to make a detour and check it out. Love the blue coat on you I have to admit though the grey mottled one is gorgeous. 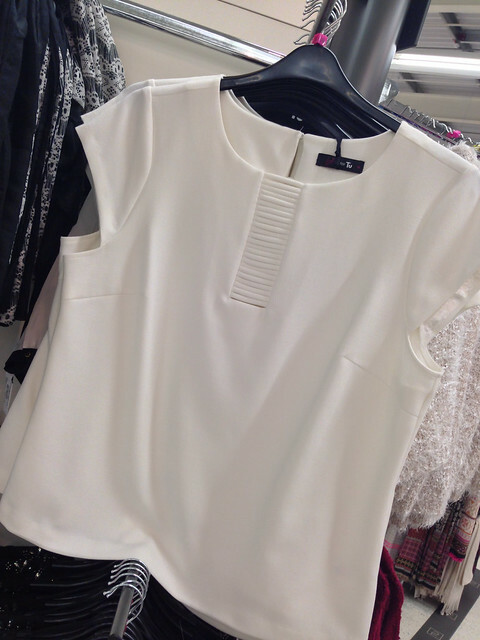 I am serious digging on that Gok top but iffy about the sleeves, I do like the lining though! Sainsbury's are so hit and miss it's incredible. I'm yet to hear of a store that stocks any full collection, our local selection is beyond dire and they don't even bother to stock any Gok. I have heard that they are beginning to sell online soon, FINALLY, though I wonder how the prices will look online next to the item... always intriguing! You have to buy the shawl Avril! I've had some good items from there lately including some distressed grey skinnies (wear them ALL the time) and a cobalt blue cable knit jumper which is 100% cotton. Also a lovely burgundy suede look bag. 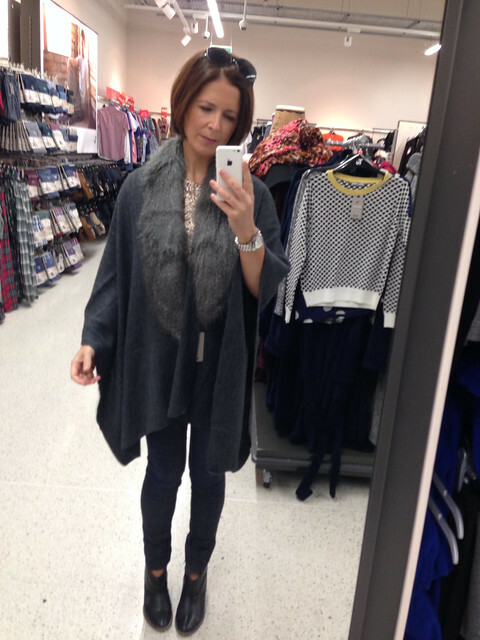 Basically a whole outfit for under £50! That colour blue looks wonderful on you. can't imagine why you would think otherwise. 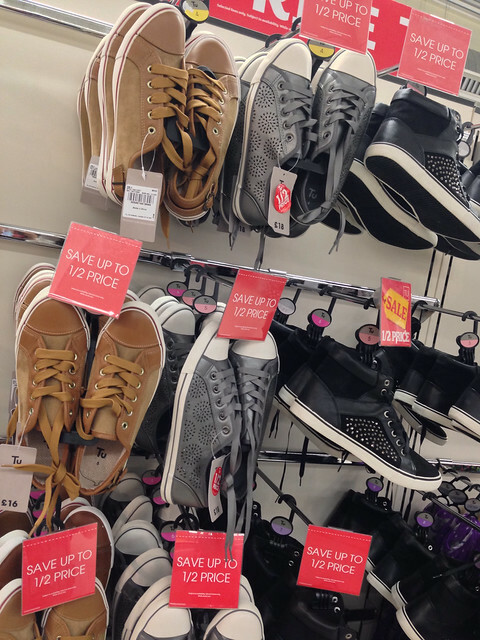 Love this round up, I do not shop in Sainsburys as it is a little trek from me but I think I may have to visit now. Loving the tartan scarf and for £12!! Might have to build it into shopping for mouse traps visit! !